The Vallejo range of paint and finishing products is well know and this is one of their latest releases in the paint range. This 200ml bottle contains a flow improver for using their acrylic paints in an airbrush. Acrylics are notorious for clogging up the fluid tip, as that type of paint dries just too fast, often as it comes out the nozzle! 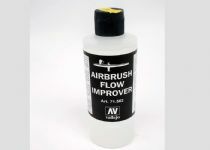 This flow improver helps to keep the paint flowing and it is a retardant to stop the acrylic drying too fast. Be careful how much you use though, you only need a couple of drops in a paint cup. I would recommend doing some tests with it to see what works for you, as I know I will certainly be using that method to see how it behaves. This bottle (#Art 71.562) retails for £10.00 and our sample came from Little-cars.com who stock the entire Vallejo range. You can order them directly from their website, or pick them up from them at the numerous models shows they attend throughout the UK each year.